The 2011 general elections in Nigeria have come and gone, so many agitations in the past that seem as if we will never get over it but today the story is absolutely different. Why and How? You may ask. In the previous elections before the April elections, we did witness several irregularities and mischievous acts associated with elections in Nigeria. Today, the saying that "change is constant" has not only become a reality in Nigeria but is much closer than the cloths we're putting on. Also, no man is an Island. Nigeria in the history of leadership has suffered in the past under the leaders who are probably not enough selfless to carry the people along in fairness, justice and selflessness irrespective of ethnicity and religion which are 500% worst than clamored corruption in the land, but we are not ignorant of it's harm as well. All said and done, Nigeria will only change when leaders are selfless and visionary as no one is perfect but we are being perfected in knowledge on a daily basis. It is only a selfless and visionary leader will make comments like these ones, "I have no enemies to fight" or "No life lost is worth the ambition of any politician." Before the elections, the agitations came so overwhelming on the electorate about whether we are going to vote based on party candidates or proven individuals of impeccable characters. Emphatically, I don't believe in party whatsoever but voting in proven selfless and visionary aspirants. 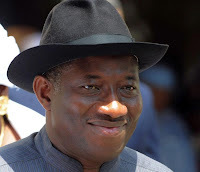 So why do I noted that President Goodluck Jonathan will change Nigeria? He is passionate about moving Nigeria forward beyond religious and ethnic sentiments...What do you think about his outlined agenda for Nigeria and the new drive of our electoral process? Power and Security seem to pose a big problem presently, but interestingly, I 'm very optimistic that what happened to Nitel will soon happen to PHCN where electricity will be much available and affordable like telecommunications. I think, on the issue of security: The Govt and Nigerians truly need to embrace the tool of Technology to help minimize it, and above all, let us be our brother's keeper respectively. God bless Nigeria! As Nigeria marks her 51st year of independence, President Goodluck Jonathan calls Nigerians to sincerely pray for the country Nigeria. So much distractions of violence and killings that are even worst than the said corruption in the land. But what will the righteous do if the foundation is faulty? Pray for Nigeria today!